When you think of private social clubs in LA, old-line names such as the Jonathan Club, California Club, and Los Angeles Athletic Club inevitably come to mind. However, you may not be aware of the newest member of that pantheon: the City Club on Bunker Hill. As a relative fledgling to the scene (it launched in 1989), the City Club prides itself on maintaining a more diverse (both in terms of race and gender), younger membership base. To that effect, the Club supports a Young Executive Committee, which just so happens to be chaired by Danni Li, a colleague of mine from Project by Project. 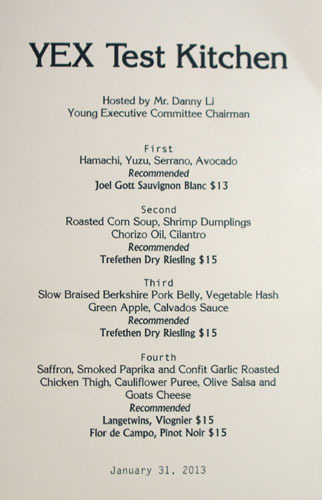 Given Mr. Li's foodist tendencies, he's instituted the so-called YEX Test Kitchen, wherein the Club's Executive Chef Brian Ayers gets to create a special menu outside of the bounds of his normal offerings. Dining here is usually closed to non-members, so I figured that it was a good opportunity to see what the place was all about. We were seated in the City Club's Tom Bradley Room, which provided for some great views of the Downtown LA skyline from the 54th floor of the Wells Fargo Center. 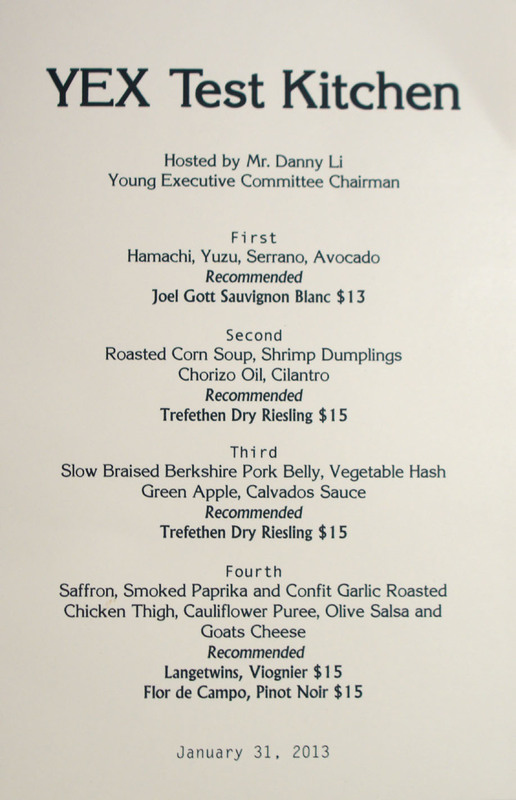 The Young Executive Test Kitchen menu comprised four courses at a very reasonable $35pp, with optional wine pairings. Click for a larger version. 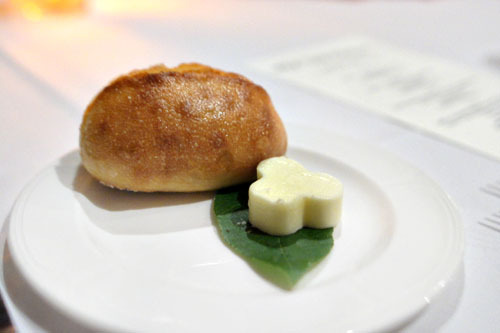 Bread was your standard dinner roll--pretty prototypical, but it did its job and had me going back for seconds. 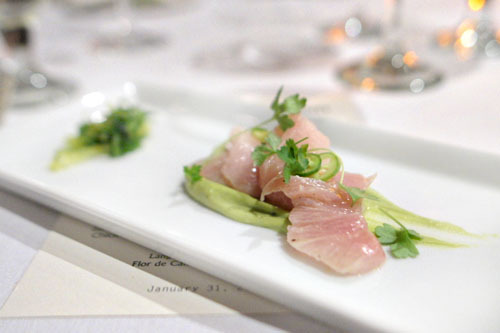 Ayers' first course of yellowtail was the standout dish of the night. The fish itself was exactly what you'd expect, with a slightly fatty, slightly briny character that was nicely paired against the lush, creamy goodness of that avocado purée. Yuzu and cilantro, meanwhile, added some well-placed pricks of acidity and herbaceousness, but even better was the sharp, lingering heat imparted by the slices of serrano. I quite appreciated the small mound of wakame seaweed on the side, too, which served to augment the ocean-y flavors of the hamachi. A table favorite. Our next course really showed off the essence of corn. It was a touch on the sugary side, but the use of chorizo oil did help balance that out. The soup worked well with the dumplings though, which I quite liked given their springy texture and tasty blend of savory and sweet flavors. 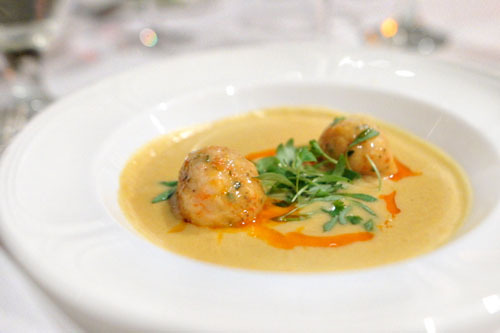 The greenery, meanwhile, was key here too, adding a much-needed jolt of levity to the dish. 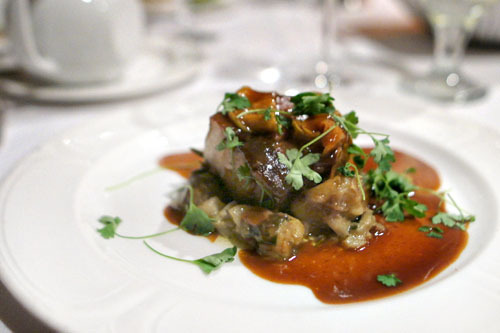 Pork belly was as tender and fatty as you'd expect, loaded with piggy flavors and a bevy of deep, dark nuances that conveyed an almost Asian-y tinge. At the same time, the mix of vegetables played foil to the meat, though I would've liked some more brightness and textural contrast on the plate to counteract the heft of the belly. 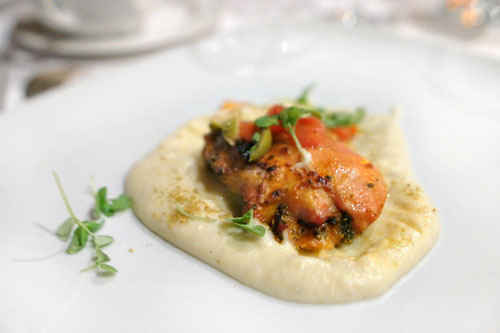 Our final savory brought out a confit'd thigh of chicken. The bird took on the flavors of the saffron-paprika-garlic combo quite nicely, showing off some delectable flavors, though it was a tad dry in certain places. The smoked goat cheese and olive added further complexity to the plate, and I appreciated the cauliflower as well, which served as a moderating base to the dish. 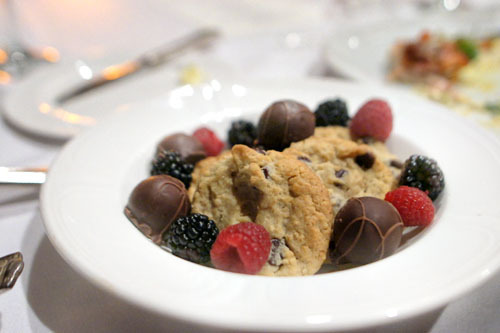 There was no dessert course per se, but rather, we were provided bowls of cookies, chocolates, and berries. I was pretty satisfied with what the kitchen was able to turn out tonight. I mean, Wolvesmouth need not feel threatened here, but the plates were generally tasty, and certainly better than any event venue food I've had, not to mention the dreck I've been served at the Jonathan Club. I would say that the cocktail program here needs some work though, and I wasn't in love with the wine pairing either. Overall, I can't complain too much given the circumstances. For that kind of food, that is a very VERY generous price. VERY generous. I mean seriously, for $35 to get those kinds of composed platings? It's gotta be nearly unheard of! Agreed, I think that must be member pricing. If that menu was offered to the public it would do very well. Anon: Agreed, when I arrived, I commented to the host how "cheap" it was. Roddy: Not necessarily "member" pricing, as I certainly am not a member. Rather, I think it was just for this special event.